From Wikipedia: The county was formed in 1872 from parts of Beaufort County and Craven County. It was named for the Pamlico Sound, which adjoins it. Pamlico County remains rural in character and flavor, although the last decade has brought a good deal of residential development, largely the result of northern retirees and investors attracted to the many miles of waterfront property. The county is anchored on the east by the Town of Oriental, a popular waystation for boaters traveling the Intracoastal Waterway, the unincorporated community of Olympia on the west and unincorporated Lowland on the east. 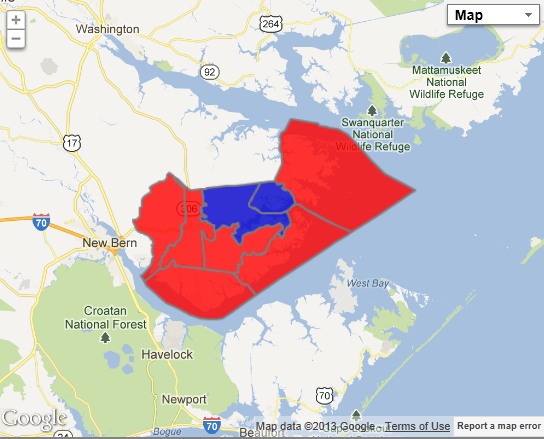 New Bern, across the county line in Craven County to the west, is the primary trade area for Pamlico County. The county has a small population, with only 13,144 residents as of the 2010 U.S. Census. The county seat is Bayboro. Pamlico has attracted a few northern retirees, but not to the level of many other coastal counties. However, the county has trended Republican in recent years. Not only are these retirees likely to be affluent Republicans, but the black population is in substantial decline. In 2000 blacks made up a quarter of a population, in 2010 they constituted slightly more than 20%. Forecast: Pamlico has consistently trended Republican since 1980, a very impressive streak. Originally this was due to white conservative Democrats switching their loyalties, but this phenomenon has probably peaked. Now the Republican trend is due to inmigration, and outmigration of black voters. This combo yielded a weak growth rate of 1.62% during the 2000s. With the ailing economy, the population growth along the coast has slowed considerably, and so has the growth from white voters in Pamlico County. Regardless, Pamlico can now be regarded as solid Republican at all levels of government, a substantial change for a county that nearly went for Michael Dukakis in 1988. It is one of the few counties in the state to be getting whiter. In 2000, 73% of the population was white; in 2010, 76%. But its meager population prevents it from being much of a bright spot for Republicans.